My friend has a young Cavalier King Charles spaniel, Lotta, and she needs advice for how to teach her to take and drop on cue. She would like to use play as a reward but her dog should first learn to take and drop on cue. She would also like to teach Lotta tricks and in some of them dog should know how to take and drop on cue. My friend has not been able to teach her dog for a while because the thing she tried didn't work. My friend tried to teach Lotta to drop in the way it's done in this video. https://www.youtube.com/watch?v=1lQ8umLaTpI At first Lotta got really excited about the toy but when she gave Lotta treat, Lotta was already taking the toy back before eating it completely. After she had done this few times, Lotta didn't want to take the toy anymore. Lotta behaves the same way no matter what kind of toy it is. My friend says it's difficult to find an object that isn't Lotta's toy, Lotta doesn't see it as a toy and that she is willing to take. My friend can't use a piece of clothing because Lotta sometimes steales them and plays with them. When my friend tried to teach that to Lotta like in the first video, Lotta got too excited about her toy and behaved the same way as I told. The dog in the first video is more calm than Lotta although that dog is just a puppy. That puppy eats her treat nicely and waits patiently her toy and she's not taking it by herself like Lotta does. There is the same problem with Donna Hill's video. She trains service dogs and two of her dogs are suitable for that sort of work. Those dogs know how to work. When my friend tries to teach Lotta to drop it, Lotta gets so excited that she won't notice or understand that my friend tries to teach her something. 1) When her dog does it at the beginning, it doesn't look similar as the end behavior. 2) This is not only about training sessions: when Lotta is playing with a toy, she is concentrating on it so much that she may not notice that one is saying something. In that case those cues are not going to mean anything to Lotta. We have a thread where we can discuss about Lotta's training and behavior. You may want to check it out. We have long time tried to find out and ask around what my friend could try next since what she first tried didn't work out. My friend was given some suggestions but we never found out would they work out or how they could be applied with Lotta. Those people never anwered to some of the questions about the suggestions. One of the things is to teach take and drop via leave it. It may not work because there are too many unknown parts in that way. One of the things is to reward with another toy. It doesn't work with Lotta because of this: my friend uses a clicker and she cannot use a verbal praise/marker. She needs to hold a clicker in one hand and a toy in another so that Lotta can't run away with it. That's why it would be difficult to throw another toy. Besides, Lotta would start to play with it and would not drop it. In other words, my friend has not enough hands for it. Following suggestion is the best one so far. This is what someone elsewhere told my friend to do with a clicker: ask with verbal cue Lotta to take a toy. After some time ask her to drop it and as a reward give that same toy back to Lotta. My friend would keep doing it for a little while and at the last time she would reward with a treat. However, that person suggested to use verbal cues right from the beginning. Like we told, that doesn't work with Lotta. So, the question is now does it work also in this way/in this order? : Would my friend do it otherwise by the same way and would she click when Lotta does one of the behaviors and would she name the behaviors only when Lotta knows them? So that she would teach them before naming them? If someone could answer to the question here, my friend could try it next. Does someone have other suggestions of what my friend could do? Honestly, the way I've gotten my dogs to drop their toy when asked was to hold onto the toy and not move. If they tried to tug, I'd let go immediately (I'd act like I was a really weak person and they'd just pull it out of my hand with no resistance). Then they'd hand it to me again and I'd grab it without wiggling it or trying to take it away. They'd pull back...I'd let go. After so many repetitions they'd finally spit the toy out in disgust like, "Fine, don't play with me, jerk." When that happened, I'd immediately get excited and engage them with the toy again. They quickly figured out that me grabbing the toy and then stilling all movement meant for them to spit out the toy to keep the game going. I don't even introduce a verbal command until after the dog is spitting the toy out via my "stilling" signal. If, however, the dog isn't trying to engage in play via tug and is just HOLDING the object, I'd probably do something similar. I'd grab it, distract with a treat or other item, and as soon as the dog spits out what is in their mouth to get the higher valued object, I'd act like a happy loon and engage them again with what they were holding. (Unless it was something dangerous/something they really couldn't play with - then I'd engage them with a new safe awesome play toy). But, that's just me and I really don't care about a formal "drop it" where the dog spits out what it is holding at my feet. I just want the dog to let go of an object when I grab it if I'm not engaging them in tug. I like this method for teaching a drop. You start with food, create an automatic and enthusiastic response, and then you can move on to other objects. When it comes to naming cues, in general you want to get the behaviour first, then give it a name. Otherwise any words you use to apply to the behaviour become white noise right off the bat. I'm not sure exactly what you're saying, but it sounds like you need to work more on conditioning the dog to recognizing a verbal marker as well as a click. Clickers are awesome but sometimes they're cumbersome and it's convenient if you can switch back and forth between the two at will. /...This is not only about training sessions: when Lotta is playing with a toy, she is concentrating on it so much that she may not notice that one is saying something....//...she cannot use a verbal praise/marker. The trainer uses the cue already at the beginning. It wouldn't work even without the cues. My friend has not been able to teach her dog for a while because the thing she tried didn't work. /...One of the things is to reward with another toy. It doesn't work with Lotta because of this: my friend uses a clicker and she cannot use a verbal praise/marker. She needs to hold a clicker in one hand and a toy in another so that Lotta can't run away with it. That's why it would be difficult to throw another toy. Besides, Lotta would start to play with it and would not drop it. In other words, my friend has not enough hands for it. My friend wants to add that the person told also to click when Lotta does those behavior. ...any words you use to apply to the behaviour become white noise right off the bat. That's the reason why my friend is not sure how to apply it with Lotta. However, that person suggested to use verbal cues right from the beginning. Like we told, that doesn't work with Lotta. So, the question is now does it work also in this way/in this order? : Would my friend do it otherwise by the same way and would she click when Lotta does one of the behaviors and would she name the behaviors only when Lotta knows them? So that she would teach them before naming them? If someone could answer to the question, my friend could try it next. I haven't read through everything but to me it depends on what your purpose for give and take is. Is it to play a game? Or is it for convenience? What I mean is... does your friend want to play a nice game of tug and fetch or does she want to be able to remove items from the dog's mouth if she picks something inappropriate up? If this is in order to enjoy playing with the dog then I encourage the intense interest in the toy. I want it. And THEN I teach the dog to give it back. This may require prying it out of the dog's mouth at first, but for us I was able to just keep gentle pressure on the toy until she released it herself. I then gave the toy back instead of giving a food reward (but my dog is generally more food motivated than toy motivated and if given food would probably tend to forget about the toy). To teach the dog to take the toy when told... I dangled the toy out in front of her. If she grabbed for it I pulled it out of her reach until she settled down. Then I dangled it in front of her again and if she resisted even for a split second I would tell her "take it!" and play tug with her... and we just slowly built up the time so that now I can swing the toy around and dangle it right in front her nose until I say "take it". When I want it back now I just maintain a little pressure on the toy and tell her "off". I admit I am tired, but I am confused by this post too. I would hazard a guess that the actual methods are not being implemented properly, not that the dog cant learn that way. That drop video posted here is my absolute favorite. It was the only thing what my friend had tried. My friend has not been sure what she could try next. The trainer teaches drop it partly for a different purpose there than my friend would like to. See more below. He also teaches the dog to drop food/treats. He tries to get the dog to be calm when you are present although he is eating food/treats. So, Lotta may not notice that one is saying something. In that case those cues are not going to mean anything to Lotta. Note: Lotta is not deaf although she behaves like she was. My friend suspects that if she would use that method in the domesticated manners tutorial her dog would associate the cue to that my friend gives her something - not that the dog gives my friend something. Besides, the trainer uses the drop cue already at the beginning. In the domesticated manners tutorial, the trainer also uses a strange way and an order to teach drop it. He is throwing treats to the dog in it although the dog doesn't have anything. When the trainer pauses throwing the treats, the dog waits patiently them. My friend tried it in order to see how Lotta reacts. Lotta started to act silly and to peg the treats. My friend wasn't actually training Lotta. When the trainer eventually did add toys to the behavior, he did get his dog to interested also in treats. When my friend tried to teach that to Lotta like in the first video, Lotta got too excited about her toy and behaved the same way as told. The dog in the first video is more calm than Lotta although that dog is just a puppy. That puppy eats her treat nicely and waits patiently her toy and she's not taking it by herself like Lotta does. There is the same problem with the domesticated manners tutorial. The dog in it knows how to work. When my friend tries to teach Lotta to drop it, Lotta gets so excited that she won't notice or understand that my friend tries to teach her something. She would like to use play as a reward but her dog should first learn to take and drop on cue. She would also like to teach Lotta tricks and in some of them dog should know how to take and drop on cue. My friend doesn't otherwise like his methods (he speaks too much and...) but that video shows the point. That's why Lotta should be teached to drop toys on cue. So, she should also be teached to take them on cue. If this is in order to enjoy playing with the dog then I encourage the intense interest in the toy. I want it. And THEN I teach the dog to give it back...//... I then gave the toy back instead of giving a food reward...//... To teach the dog to take the toy when told... I dangled the toy out in front of her....//.... I would tell her "take it!" and play tug with her..
ask with verbal cue Lotta to take a toy. After some time ask her to drop it and as a reward give that same toy back to Lotta. My friend would keep doing it for a little while and at the last time she would reward with a treat. However, that person suggested to use verbal cues right from the beginning.Like we told, that doesn't work with Lotta. So, the question is now does it work also in this way/in this order? : Would my friend do it otherwise by the same way and would she click when Lotta does one of the behaviors and would she name the behaviors only when Lotta knows them? So that she would teach them before naming them? Does someone have other ideas of how to teach those behaviors so that the reward would be to continue playing with the toy? I'll admit I only skimmed your posts. The way we teach tug/drop it in puppy class at work is to simply hold the dog's collar and hold your hand under their mouth. Do not pull on the item or toy, and definitely don't pull on your dog. They can't tug back because you're holding their collar. Just wait. This has so far worked for every dog I've tried it on, although it could take several minutes at first. When the dog releases the toy, their reward is they get to play with it again. When the dog is reliably releasing/dropping things as soon as you grab her collar, then you can introduce the verbal cue. Don't have a video tutorial, sorry. As far as 'take it'. I didn't formally teach it. I just taught my dog to drop on cue and then said 'take it' when I offered her the toy back. She caught on by association. I just wanted to comment on a few things. The dog in it knows how to work. When my friend tries to teach Lotta to drop it, Lotta gets so excited that she won't notice or understand that my friend tries to teach her something. IMO, if a dog is so excitable that it can't focus and is out of control...no learning is going to be done by the dog, whatever method you happen to be employing. I would highly recommend going back to basics and starting from square one. While you're dog doesn't need to be "obedience" trained in order to learn "tricks", having a solid foundation with a dog that can focus on you is going to help with anything you try to do. Is your friend able to take a basic obedience class, or possibly have a one on one session with an instructor who comes to your home? All of the videos and instructions in the world aren't going to amount to anything if you aren't able to implement the techniques correctly and being physically shown what to do by someone who is there and can experience what you are experiencing in person is going to be your best bet for success. On a similar note, I know you've mentioned multiple times that you specifically want a clicker training tutorial. BUT. If you aren't obtaining the results you want...switch to a different technique. Whether it be that you aren't implementing a fundamental piece of the technique correctly, or the technique just isn't helping the dog learn, find something else. 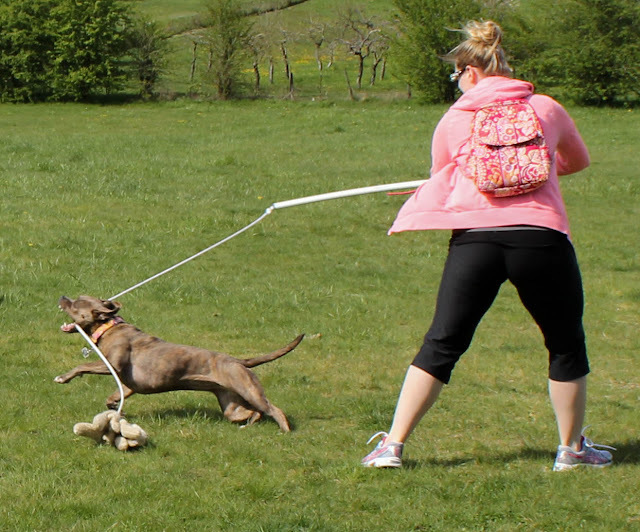 There are MULTIPLE ways to teach a dog something, and just because you aren't "clicking" doesn't mean you aren't training your dog in a positive, fun way. For me, personally, I find using a clicker very cumbersome when I'm not actively free shaping a response. And because I find it cumbersome, I frequently make errors in my timing, my body position, and/or my rewards and my dogs look at me like I'm an idiot. So, for me personally, I look to other methods that I am comfortable with and can carry out successfully (lure/reward, mainly, although I do still use a verbal marker versus a click). That's the way how the person adviced to teach them who gave the following suggestion. S/he probably meant that since Lotta likes toys so much, the behaviors would be teached so that the reward would be to continue playing with the toy instead of giving treats. There is no problem with using the toy as a reward, especially if that is what is more rewarding for Lotta vs. food. You don't need to change your training technique...just use the toy as the reward instead of food. Rewards can come in many shapes and sizes - it is all about finding what is best for your dog. And I stand by what I said earlier: if the dog refuses to drop the toy and you stop all play, most dogs typically spit the toy out because it's not fun when you aren't engaging. Then when the toy is dropped...the game becomes fun again. Another way to practice "give it" is playing tug. If your dog isn't crazy about the game, this won't be the right method for him. But if he's a crazed tugger, the game could be of great value. Start off by playing normally with your dog. At some point, hold the tug toy still and say "give it." If he continues to tug, just wait patiently without tugging back. If you're not participating, your dog will eventually grow bored and drop the toy. At that moment, praise him and encourage him to take the toy again. You won't need a treat, because his reward will be restarting the game. ^ And I know what you are going to say..."Don't say a verbal cue before the dog knows what it means." Yes, BUT, by saying it only once and then not repeating it AND pairing it with a behavior (you stop all play), even though the dog doesn't inherently understand what "give it" means, he knows it is important. He'll likely pair "give it" with you stopping all play, and he knows that in order to get you to begin playing once again he must spit out the toy....so "give it" = spit out the toy to continue playing. My friend has taken Lotta to courses and she is going to take Lotta to them again as soon as she can. She would like to discuss about dog training in this forum until then. By tricks my friend means the ones where the dog for example carries an object. So, s/he should know how to take, hold, drop that object. /......And I know what you are going to say..."Don't say a verbal cue before the dog knows what it means." Yes, BUT, by saying it only once and then not repeating it AND pairing it with a behavior (you stop all play), even though the dog doesn't inherently understand what "give it" means, he knows it is important. He'll likely pair "give it" with you stopping all play, and he knows that in order to get you to begin playing once again he must spit out the toy....so "give it" = spit out the toy to continue playing. So, Lotta may not notice that one is saying something. In that case those cues are not going to mean anything to Lotta. And then she is not going to know that the cues are important if she is behaving like we have told above. So, Lotta should learn to listen to her owner (not only verbal cues and it doesn't depend on how many times they are said). My friend would rather discuss about this in some other thread. There is no problem with using the toy as a reward, especially if that is what is more rewarding for Lotta vs. food. You don't need to change your training technique...just use the toy as the reward instead of food. Rewards can come in many shapes and sizes - it is all about finding what is best for your dog. When we are talking about teaching these behaviors, this is not only about training sessions: when Lotta is playing with a toy, at some point she drops it. So, there is no need to hold onto Lotta. "I've added the "Get it" cue, but not the "drop" cue, because I don't think he fully understands, yet." What if Lotta doesn't understand take either? When that behavior should be named if Lotta doesn't notice that my friend is saying something? Note: that trainer had named "take" behavior first except she is saying the cue more than once. Could/should my friend teach those behaviors by the same way than in that tutorial although she cannot name them yet? ...And then she is not going to know that the cues are important if she is behaving like we have told above. So, Lotta should learn to listen to her owner (not only verbal cues and it doesn't depend on how many times they are said). My friend would rather discuss about this in some other thread. /.... Lotta got too excited about her toy and behaved the same way as told. So, Lotta may not notice that one is saying something. 1) If my friend for example watches a tutorial about something, she doesn't always know how she should apply that with Lotta. 2) It's not always so clear to my friend how to teach something. It now seems like that some of you think that your suggestions are worthless or useless. That is not the case. Not all of them are. We are going to go through with your suggestions one at the time and tell what kind of issues my friend does/doesn't have with them. First of all, you have suggested courses. /....My friend would first like to use play as a reward besides only treats. She would like to use different kind of toys for it.....//.....That's why Lotta should be teached to drop toys on cue. So, she should also be teached to take them on cue. The trainer teaches drop it partly for a different purpose there than my friend would like to. He also teaches the dog to drop food/treats. He tries to get the dog to be calm when you are present although he is eating food/treats. My friend did try it and we did tell you about it then. One of the things is to reward with another toy. It doesn't work with Lotta because of this: She needs to hold a clicker in one hand and a toy in another so that Lotta can't run away with it. That's why it would be difficult to throw another toy. Besides, Lotta would start to play with it and would not drop it. In other words, my friend has not enough hands for it. or my friend could teach it with two toys if she had many hands. My friend hasn't been able to try it yet because no one answered to the question there but the suggestion that someone gave elsewhere (what we told earlier about) seems similar to what is told in the part: "Play and practice" in that article. Means that it may work. "That's the way how the person adviced to teach them who gave the following suggestion." We have told what it is. Means that it's similar to that suggestion. My friend could follow the instructions in that tutorial if someone could answer to the questions about it. Honestly, your questions are very specific to what you and your friend are seeing in the dog. We can not see nor interact with her so there is no way we can over the internet fine tune the suggestions. That has to be done really by someone who is actively working with her. A video MAY help some give better suggestions but even then I dont know. Part of the problem here, I think, is that dog training isn't like cooking from a cookbook. There isn't any one thing anyone can say or tutorial we can point you to that is going to be the magic answer for your friend and her dog. Every dog, every trainer is an individual and there is a lot of trial and error involved in finding the technique that will work best. It gets frustrating for people who are trying to help to just be told all the reasons their advice isn't going to work. Having said that, if this were my dog I would take a step back and work on impulse control. If she gets SO excited during training sessions that training is this difficult or frustrating, then there is no technique in the world that will help train a specific task until she learns some self control. Check out games like "It's Yer Choice" or "Puppy Zen" on YouTube and start there, and set aside specific tricks until she can calm down and focus. I would suggest having the toy on a line, or using something like a flirt pole if the dog runs off with the toy. Your friend will have control of the toy. I use a flirt pole/toy for moving exercises, the dog must sit or walk or wait before I engage her with the toy again. This is a flirtpole. Kong brand has one actually, or you can make it.